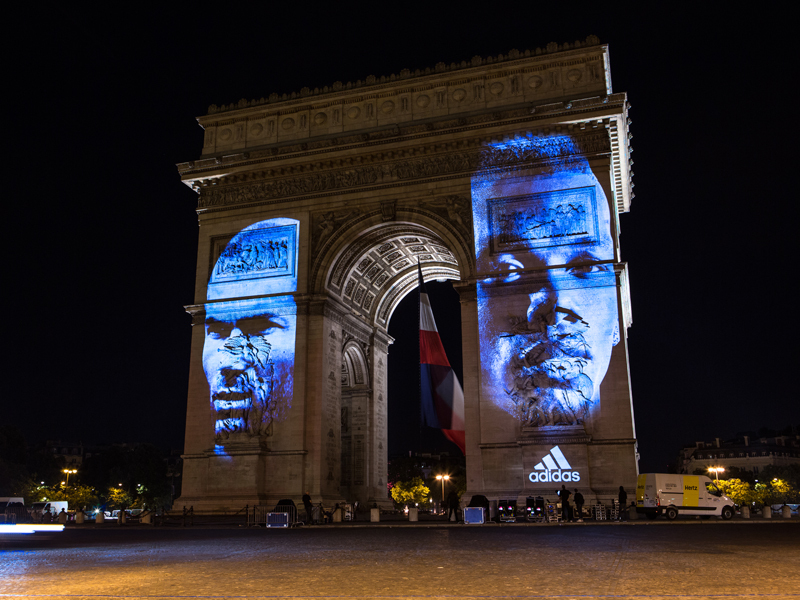 Paris, 10th July 2016 – As UEFA EURO 2016TM moves into the Final, adidas today unveiled a "First Never Follows" projection on to the façade of the famous Arc de Triomphe monument in the centre of Paris, featuring legendary midfielder, Zinédine Zidane, and rising star Paul Pogba. The projection onto one of the world's most recognisable landmarks shows the face of Zidane with the accompanying words: "Écrire Sa Propre Histoire" meaning "Write Your Own History". The projection then shows the faces of Zinédine Zidane and Paul Pogba together, before the message ends with the face of Pogba and the line "First Never Follows". Zinédine Zidane is widely considered to be one of the greatest players of all time, winning the FIFA World Player of the Year Award on three separate occasions; in addition to the FIFA World Cup and UEFA European Championships with his country. Now, it's time for the next generation of players including Pogba to write their own history during tonight's UEFA EURO 2016 Final in Paris. For further information please visit adidas.com/football​ or go to facebook.com/adidasfootball​ or follow @adidasfootball​ on twitter to join the conversation.